In this installment, we’ll see the details of ‘Services’ and take few customers queries about set up of ELEX WooCommerce DHL Shipping Plugin with Print Label. Here are the latest improvements incorporated in the plugin. One of our very new customer Liezl, who integrated WooCommerce DHL Shipping Plugin with Print Label in her WooCommmerce store, started with an interesting conversation with our Online Support representative about the plugin. Let’s start with the conversation. Can anyone explain to me what each of the shipping services is? 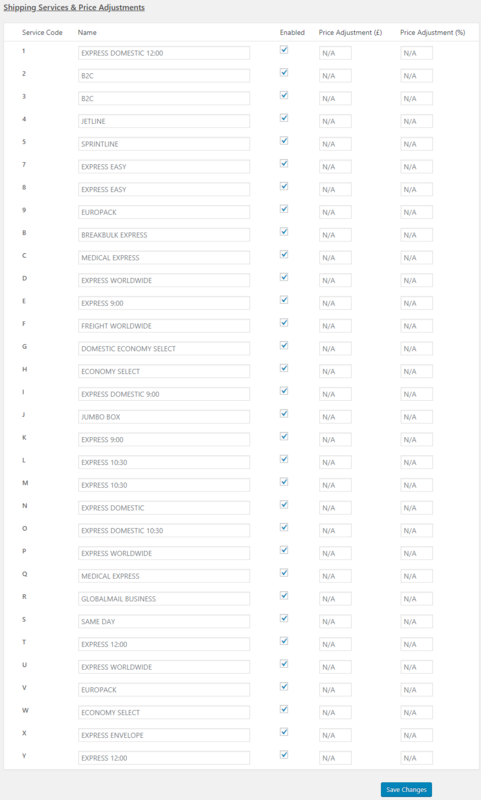 We are shipping goods from Dubai to Europe, UK, and Africa, but I have no idea what those services mean. Before defining Sipping Services, let’s see where you can find the shipping services in the plugin. Navigate to Dashboard> WooCommerce> Settings> Shipping> DHL Express> Rates & Services. If you’ve not purchased the plugin yet, use the Live Demo site to get to the dashboard. Demo sites are usually read-only in the admin section. You can still see all the option use the shop there to place an order and test the plugin. At the Rates & Services tab, you have a list of so-called services. Services refer to the type of shipping service it is. For instance, the last one mentioned as “EXPRESS 12:00” refer to a shipping service where DHL ships any package before 12 o’clock the next day to an international destination. Similarly, “EXPRESS DOMESTIC” 12:00 is the shipping service by DHL where it delivers the package before 12 o’clock the next day domestically. Any service having a specified time in its name is called Time Definite Delivery. This type of delivery service is one of the fastest DHL offers. Time Definite Delivery services use all modes of transport and the first available land vehicle is used to ship the parcel. In case of domestic time-definite delivery, parcels are expected to reach the destination before the time mentioned in during the next working day. While in the case of international shipping with time-definite delivery, the number of days can take multiple days. Thus, the mode of transport, distance, and customs laws affect the time in case of international delivery. Get more insights into DHL international delivery with DHL Express. The second type of services with DHL Express is same day delivery for both domestic and international shipping. In this type of service, the first available flight is used to ship the parcel making it the fastest available shipping service offered by DHL Express. And the third type of services is the Day Definite service. This is a relatively slower service and only available for international shipping. To wind up you can offer any type of service offered by DHL to your customers. The plugin calculates the real-time rate for the services you choose by marking the boxes corresponding to the services here. If you uncheck a particular service, it will not be available at the cart/checkout page. So the plugin gives you the liberty to offer the fastest delivery option to your customer or offer only selected services. You can also change the type of service while editing the order details in the edit order page. The premium version let you edit the name of the service as per your convenience and adjust the shipping rates on top of the real-time rates in terms of $ or %. Is there a way for the plugin to charge for only one items weight even if we have multiple items? Our products weigh between 2-25gms each but we have to (for shipping) have their weights as 0.5kg each. This means if our client buys 3 items, they are getting billed for 1.5kg shipping, when in fact all 3 items together are still under 0.5kg. Is there a way to only bill them for 1? The scenario here calls for the box packing available in the packing ‘Packing’ tab. Select the option of ‘Recommended: Pack into boxes with weight and dimensions’ for the Packing Options as shown below. There are few already assigned box present in the section. You can create your custom boxes by clicking on ‘Add Box’ button at the bottom of the list. The ‘Package Type’ has three options in DHL Box, Flyer, and Your Box. So you can assign the type of box you use. Now consider the situation in the query, you can add a box with a dimension that fits a considerable number of products in it, in your case 3. Now in the Maximum Weight Box for your box enter the maximum weight this box is going to carry. Let’s suppose you keep it 0.5 kg. So with this setup, until one box is not having 0.5 kg of products, the second box will not be selected. The shipping rate here is not dependent on the number of the product. Plus, this call for the real weights of the products assigned to them. 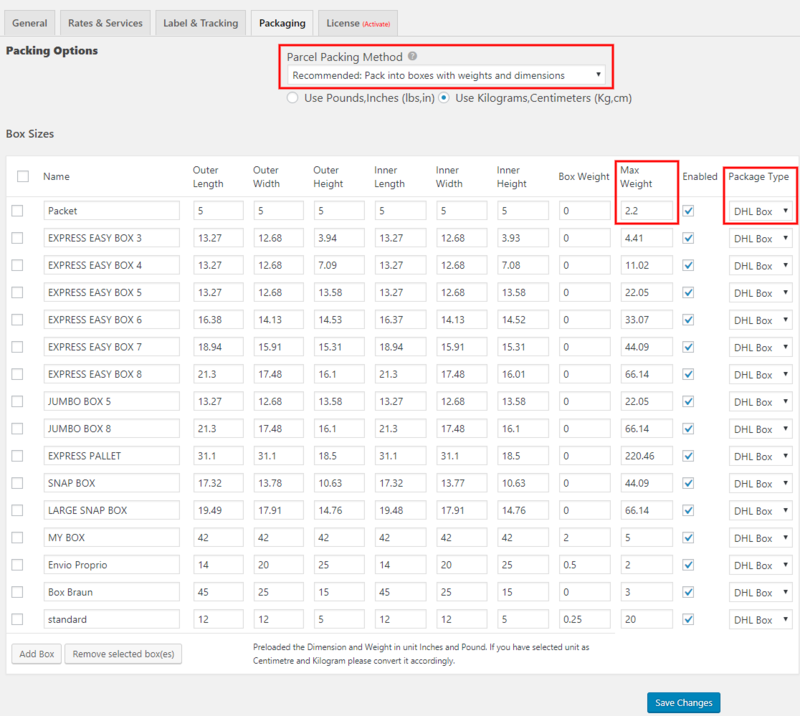 As you mentioned, with the actual weight of 2-25g per product, you can have multiple numbers of such product in the box you just assigned. In this way, you can charge your customers based on the total weight of the box. Make sure you don’t have individual pacing option because that will pack each product in separate boxes and charges will be multiplied with the number of boxes used. 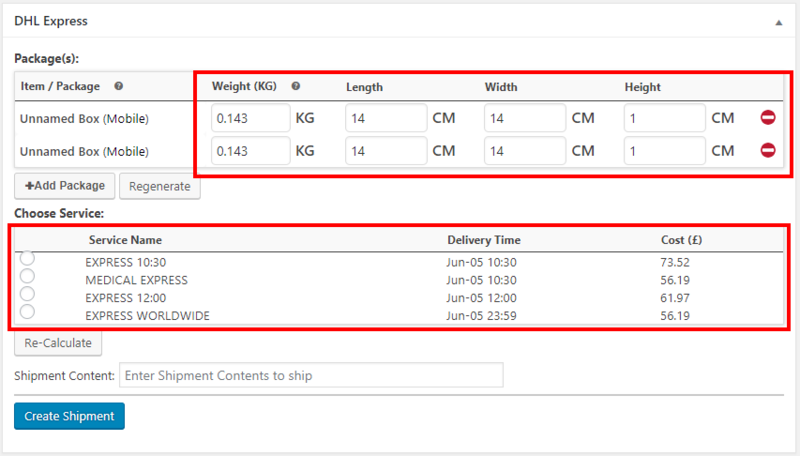 I keep getting this error though when I try to generate a Waybill: DHL Express Create Shipment Error: 154: SA field value is invalid All our products are configured with weights and dimensions. I’ve removed the signatures and the error no longer pops up, but neither does the waybill? Where do I go to find it once it’s generated? If you don’t find the waybill option you need to enable ‘Archive Waybill’ and select its document type, which is necessary for international express services. And after this, you will be able to have the waybill. If you have not entered the content description, make sure have it entered in the edit order page for the successful creation of waybills. You can also refer to the detailed article on generating correct waybills. E-Commerce has opened up new ways of selling products and service. It has given the opportunity to sell products and services internationally. And the small and medium business has benefitted the most out of this. WooCommerce powers 50% of such e-commerce stores today. And the next thing that has been backing every successful WooCommerce store is the shipping integrations. Fulfillment service providers like USPS, FedEx, UPS, DHL, CanadaPost, Australia Post and other domestic services has powered online businesses. ELEX (under the brand of XAdapter) has been the Official Partners for the integrations for most of these shipping services provides. The list of partnerships includes USPS, Stamps.com, DHL, and EasyPost covering services form FedEx and UPS. Shipping Plugins usually incorporates the features to a WooCommerce store. The Complete list of Shipping Plugins for all locations and user types. If you are looking for an economic and versatile shipping plugin, go for ELEX Easy Post Shipping Method Plugin for WooCommerce. It has the three best shipping carriers in USPS, FedEx, and UPS and you can start sending parcels internationally at 1 cent per parcel. Or you can opt for ELEX WooCommerce DHL Shipping Plugin with Print Label that integrates one of the most extensive shipping services by DHL. You can contact our Online Support for any technical issues or pre-sales queries. You can also leave your valuable comments in the comments section too. We’ll be more than happy to respond back. Happy Selling!